i hate kalafong (hell). there are many reasons for this (here, here, here, here, here), most emotional, i confess. but if i am honest there is one incident that stands head and shoulders above the myriad of traumas that i experienced there. one of the strange idiosyncrasies of kalafong (hell) is that some time during each night shift, all the sisters of each ward get together in the duty room and eat chicken feet. i have no explanation for this. maybe there is an abundance of chicken feet in the area. maybe the sisters are paid in part with chicken feet that absolutely must be eaten before they leave for home after their shift. maybe it is part of some bizarre ritual that initiates all kalafong sisters into some secret evil cult. i simply do not know. i was a mere fourth year medical student which meant i was at the absolute bottom of the rung that night on call for internal medicine. i knew nothing and was of almost no help to anyone. the only thing that i could do was to put up drips, so the senior medical students would send me to the wards whenever they got a call that a drip needed inserting. for some reason kalafong sisters never put up drips. maybe there was a fear that the patients were allergic to chicken feet and the residue of the no doubt scrumptious delicacy on the fingers of the sisters could potentially cause the patients harm. they were clearly not about to take that chance, so there was plenty of opportunity for me to hone my already very well honed drip inserting skills. i had just left the female medical ward after inserting a whole host of drips and was quite keen to see what was going on in casualties. i walked in. "drip to be inserted in female medical." the sixth year student smiled. i don't think it was really meant to be malicious although it felt that way at the time. i think it was more a relief that he had done his years of continuous drip insertion honing and was glad that he honed no more. it was the natural cycle of things and he had passed the batton to the next group. it was simply my turn. "i was just there!" i protested at no one in particular, turning to leave with my shoulders sagging just enough to be noticable to the discerning eye. i entered the ward through the back door. the main door had been locked by the sisters. this was another thing one got used to there. it was just something the sisters did at night. the reason for this behaviour elluded me, especially when they had just called for someone to insert a drip. you would think that they would unlock the door in anticipation of that person actually arriving to insert the drip. maybe they needed their privacy while performing strange initiation rites with chicken feet. as i entered the ward, a patient looked at me. "doctor, help me! i'm dying!" i froze. it was dark. i could only make out the patient's shape, silhouetted against the dirty cream coloured wall. yet her eyes were so wide with fear that i could see her white sclera. i felt a shiver go down my spine. what was i to do? i was only a fourth year. i didn't know this patient and even if i did, i had no knowledge to actually help her. in my naivety i hadn't yet learned the rule that more often than not, if a patient tells you they are dying, it is because they are in fact dying. the one thing i knew is that i couldn't ignore her. i walked up to her. she lifted her arm weakly. then suddenly her fingers encircled my arm and all her remaining strenght seemed to go into her grip. her nails bit into my flesh as she pulled me close to her face. "help me doctor, i'm dying!" she repeated. she scared me, so i pried myself loose and checked her file. she had been admitted the previous day with the diagnosis of meningitis. antibiotics had been prescribed but only one dose had been signed for since admission. probably the drip had been out when the other doses were due and once some poor fourth year had reinserted it, the sisters hadn't bothered to put up the dose that had been missed. at least there was something i could do, i thought. i could check to make sure the drip was working and get the sisters to give the last dose of missed antibiotics. somehow i allowed this thought to make me feel better. i would help this lady and all would be well. i checked the drip. it was working well. "don't worry, mamma, i'll send someone to help right away." i said as i turned to leave. she lunged for my arm again when she saw that i was going, but there was no strengh left and she missed. as i walked away a knot developed in my stomach. i felt that i had failed this old lady. i had done the little bit my knowledge had permitted me to but i had also allowed my fear of her and of what she was facing to intimidate me to such an extent that i hadn't really stayed to comfort her. i was determined to be a change in her circumstances and her life. i would speak to the sisters. i walked to the duty room. the door was closed but there was an almighty din emanating from inside. the sisters seemed to all be shouting and laughing in unison. i knocked and opened the door. for a moment the bright light from their happy little room blinded my eyes that had become accustomed to the darkness of the ward. the light seemed to pour out into the gloomy ward behind me. all the sisters were sitting around the table eating chicken feet. when they saw me they all went silent, but continued eating. "good evening sisters." no answer, unless silence is an answer. "sorry to bother you but the patient in bed 5 in cubicle d is in a bit of distress." "we'll check on her now now." i knew what now now meant in our strange south african english. now now was not as soon as now and implied no urgency. now now was not as now as i wanted it to be. "ok," i said, knowing that if i antagonised them they would purposely postpone checking on her just to teach me a lesson. "also i see that she hasn't yet received her last dose of antibiotics. her drip is working, i checked, so please give it to her when you go to her." the sister looked up from the chicken foot she was now toying with between her fingers. i saw in her eyes that she despised me, although i had never laid eyes on her before in my life. some things in kalafong one learned to accept. "i said we would see to it now now!" she repeated. then her head dropped back down to give the chicken feet the full attention they seemed to deserve. i stood still for a minute. then i quietly closed the door. as i walked away to do the drip i had actually come to the ward to do, raucous laughter errupted from that small brightly lit room. it brought me to a stop in the middle of the floor in the dark ward. i felt tears well up. i didn't know if i wanted to cry because the sisters were clearly enjoying a joke at my expense or at the futility of an old woman who lay in bed 5 in cubicle d all alone with the fear of death over her. i just knew there was something horribly wrong with the whole picture. i got the drip up and running in double quick time. i then rushed off back to casualties, but not before quickly checking on the patient again. when i approached her she still had the same stare. this time her arms lay still on the bed beside her. "don't worry, mamma," i said, "i have asked someone to come and help you. it is all going to be ok." she didn't react. "i promise i'll also come back myself tonight to check on you." a little of the fear went out of her eyes. only a little. on the way back to casualties i made sure i composed myself. it wouldn't be good to show the senior students that i had been so affected by something they no doubt had seen quite a lot of. anyway everyone always said not to let kalafong get to you, otherwise it could change you forever. at that moment forever seemed like such a long time. the sixth years were busy doing a lumbar puncture behind one of the flimsy curtains in the casualty unit that seemed designed to give the impression of privacy without actually delivering any real privacy. one of them looked up. "sorry dude, but they just called for another drip in male medical." i turned and walked out without saying a word. the quiet of the open air kalafong corridors could possibly afford my soul a bit more peace than the overwhelming noise of human suffering of casualties. usually i could handle it, but then i felt a despondency and futility that was too much to bare. in the end there were three drips in male medical so it took me longer than expected to get them all up and running. this time it didn't bother me. i was in no rush to get back to casualties. also i knew i had told the old lady in female madical i would check on her and i was afraid. i was afraid of what i could not do for her. i was afraid i would be inadequate. i was afraid of the face of fear that i had seen in her eyes. somehow her reality at that moment was too real and i didn't want to face it. i wanted to be at home in my warm bed, ignorant of how terrible life could be. but i knew i had to go to her. if for nothing else, i had to just be with her so that she was not alone. i walked slowly to female medical. i walked past the duty station. this time the door was open, but besides that there was no discernible difference. all the sisters still sat exactly where they had been. some of them were still eating the last of the chicken feet. the light from their room lit up half the ward, but did not reach all the way to cubicle d. they didn't see me slip past them so their laughter must have been aimed either at someone else or just part of the normal merriment associated with people sharing a meal together. still, just like the light, it seemed to me to be out of place. "mamma, i'm here" i whispered as i approached her bed, just in case she was asleep. she lay with her head to one side. she didn't stir. i walked closer and took her hand. it was cold and clammy. i leaned towards her face. even in the darkness i could see her eyes were open, but they were fixed in the stare of death. she had died alone and i had failed her completely. 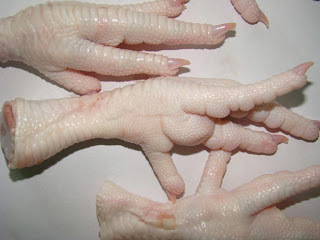 i have hated the sight of chicken feet ever since. anaesthetists and surgeons work together quite a bit, but they are very different creatures. sometimes it takes a bit of effort for them to understand each other and get along. some would say it takes effort from pretty much anyone to get along with a surgeon. 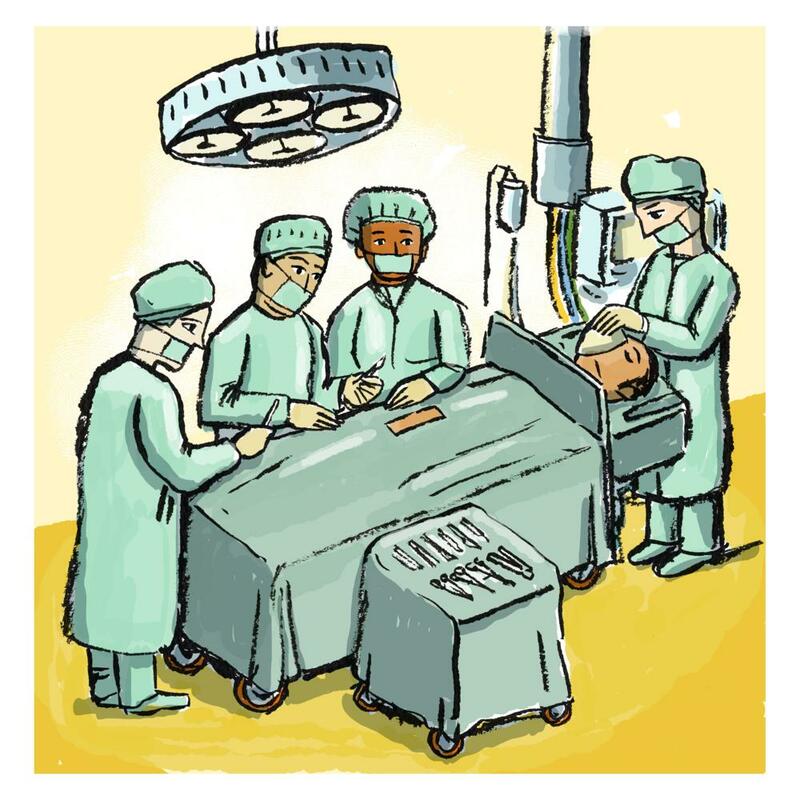 so it is nice to hear a story occasionally of an anesthetic colleague that is willing to do what is needed to understand and get along with the general surgeon he was working with. these were the observations of a student during his rotation through the anesthetics department. when the student in question arrived at work, he was quite excited to hear that he was dealt into the emergency theater. "off you go," said the prof to him, "they are still busy with a trauma case from last night." when he entered theater it was clear that there had been quite a lot of action. the floor was covered in blood which had been smeared around by the feet of the surgeon and the floor nurse, creating a macabre work of art with bold red strokes of the brush on the canvas which was the floor of theater. against the wall on a rack hung multiple blood soaked swabs, bearing testimony to the battle that had already taken place in that small room. the surgeon was still frantically busy working in the open abdomen, his arms besmirched with dark blood to his elbow. the front of his gown was similarly stained. the student looked around and took in the complete picture of this fight between life and death, yet immediately he noticed something that didn't seem to fit in with the high stress situation that met the astonished student. off to one side, the anesthetist sat quietly in his chair with his arms folded and a calm expression on his face. he wasn't even looking at the monitor. in fact he sat slightly behind it. from this vantage point he glanced up, greeted the student and offered him a chair. the student sat down wondering at the steel nerve of this anesthetist in the face of such a tense situation. then an alarm went off on the monitor. the student jumped up to get out of the way as his senior finally moved to see what was happening. but all he did was to turn the alarm off and sit down again. and so the student sat there with him, too nervous to speak and wondered what was going on. after quite some time the intense concentration of the surgeon was broken. he turned to the anesthetist. "how are things going up there?" he asked and then as an afterthought added, "the bleeding is now under control." the anesthetist slowly looked up and spoke for the first time with a wry smile plastered across his face. "well actually the patient has been dead for quite some time now," he said, "but i know how much you surgeons like to operate and it looked like you were having so much fun, i didn't want to disturb you." the man was an enigma. those who knew him soon realised he was the only person in kalafong (hell) that cared anymore. somehow that terrible place hadn't eroded his soul to such an extent that he no longer gave a damn about his patients. yet to those who only had a fleeting acquaintance with him, he seemed course and even harsh. he didn't fit into kalafong (hell), yet he would not have fitted into any other place quite as well as he fitted into kalafong (hell). yes, he was an enigma. my consultant in kalafong (hell), the enigma, had a certain way of bringing his point across (here and here). on the face of it it was never pretty but it was always funny in some twisted sort of way, despite that never being his intention. he also had a knack of going off on some wild tangent for seemingly no reason. 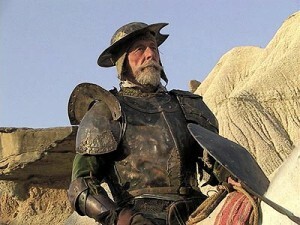 what we may have thought was normal would more often than not set our own don quixote off on some wild quest chasing what seemed to us to be little more than windmills. but who were we to argue? he was after all the consultant. so on that particular morning, when the house doctor showed the don the official consultation form from the internal department requesting us to drain an abscess on one of their patients there really was no way for him to know that this would cause the old man to fly into a frenzy and charge off towards the wards of the unsuspecting internal medicine department, his entire entourage, myself included, in tow. i was a very junior medical officer so i kept to the back and just observed. "where are the doctors?" he bellowed at no one in particular as he stormed through the doors. "are you all deaf? i said where are your doctors? i want them here right now!" from behind a few curtains here and there the house doctors of that department peered, eyes wide, like frightened rabbits. still they froze and moved no closer. "i said come here!" he shouted pointing directly at the closest one. "you! are you a doctor?" it seemed like a silly question. of course he was a doctor. but our master continued, "i said are you a doctor?" "yes sir." wrong choice of words. "don't call me sir!! do i look like i've been smacked on the shoulder by some foreign queen?" "don't call me professor!" his face went red with rage and despite it seeming impossible, the volume of his rantings increased. "i am not one of those academic professors in that ivory tower on the other side of town who operate by remote control from the comfort of their large chairs in their studies! i am a real surgeon!" "that's better." his voice dropped down back to jet plane decibels. "i asked you a question. are you a doctor?" the poor guy's lip quivered as he carefully and deliberately chose his words. "what degree do you have?" we all cowered out of the direct line of sight of the man just in case he asked us the same seemingly easy question. at least we now knew not to call him sir or professor. but the poor internal house doctor had no such privilege. "i have an mbchb, doctor." he almost whispered. "yes you do. and do you know what that means?" before the confused victim could answer this next seemingly easy question our consultant blundered forth. "bring me a blade and show me where this patient is with the abscess. a few moments later we were all standing around the patient wondering what was going to happen next. the house doctor was visibly shaking. "i asked you a question?" continued our mentor, toying with the knife in his hand that the doctor had fetched for him "what does mbchb mean? or what does the chb part mean? the mb part is easy. that means you can give pills out. any old monkey can give pills out, but now i want you to tell me what the chb means"
"i'm not sure sir, i mean doctor!" "if you call me sir again i will have you thrown up against the wall and i will bring a firing squad in here and have you summarily shot!" our consultant believed a firing squad covered a multitude of sins. "well let me tell you what it means. you see this sharp shiny thing in my hand? this is a blade. chb means you are trained to use one of these. it means you have a bachelors degree in surgery and it means you can lance an abscess. now watch me." he turned towards the unsuspecting patient. "you see now. this is the blade and this is the abscess. and this is the blade draining the abscess." with that he sunk the blade deep into the abscess. the patient winced, but, surprisingly made no other objection. i assumed he felt the threat of the firing squad may have been a general threat and that it was not limited to the poor house doctor. also once the thick stream of puss came out, there even seemed to be relief on the patient's face. "i didn't consult you. that isn't even my patient."